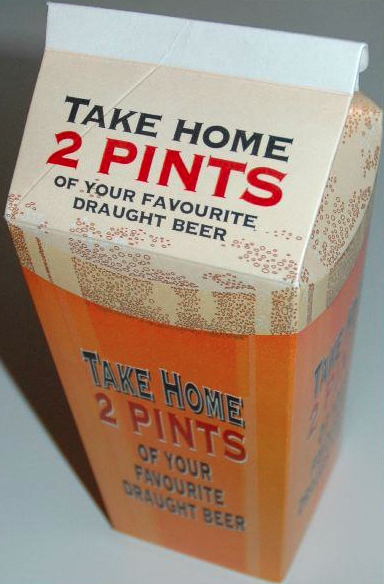 The 2-Pint Crafty Carton™ is a revolutionary carton changing the bar industry. Imagine your regulars are IN LOVE with the fabulous new wheat beer and the seasonal local ale is selling fast. But, many of your regulars leave early to avoid driving under the influence. Sound familiar? With the new Crafty Carton™ disposable container, your bar patrons can now enjoy two pints of their favorite draft brew at home. It’s simple, easy to use and environmentally safe. The new Crafty Carton™ increases bar sales, provides additional advertising and increases your overall bottom line. I suspect there are a whole host of state-specific laws to review. Is this considered an open container? Personally, I'd be willing to give them a try at my favorite local brewpubs. Growlers have limited lifespans once opened, and I often decide against growler purchases if I know that some of the beer may go flat before I finish. But two pints of that special beer would be no problem. Have you seen these "in the wild?" Any pubs offering them? The one thing I'd be concerned about would be the transfer of a waxy flavor to the beer - I've had that happen with milk. All it needs is the little port to stab a straw through. I have not seen these but have seen similar packages for alcohol in a Korean market nearby. It is lighter and more easily packable in large quatities than bottles are. Also a whole lot less breakable. I think it is a good idea to explore, although it requires you consume a quart at a time with that size package. Not a problem for big beefy me, but for mere mortals that might not be so good. I don't know... I like my growlers too much. We have one from the Sonoma Springs Brewing Co. in Sonoma, CA that's way too awesome to not fill at various Wisconsin taprooms. It's a great conversation starter. Growlers do make a good conversation starter. I see this as serving a different need, though I'd still like to see them "live" before deciding.